This presentation (from the “Ted Talks” lecture series) by Dr. Jill Bolte Taylor, neuroanatomist, is a fascinating account of her experience and realizations while experiencing a stroke first-hand, caused by a massive brain hemorrhage. What I enjoyed the most was her vivid depiction of the differences between the functioning of the left- and right- hemispheres of the brain, and the sharp distinction between the two forms of consciousness that make up the whole human being. Our Heilkunst understanding of therapeutics rests on the ultimate foundation of this distinction between the two polarities of the human being, and healing ultimately is measured by their re-integration into a whole. I often refer to my work with individuals as a form of “couples counselling” – that is, working on the inner marriage between their two beings (where the external marriage is typically the stage upon which these inner dynamics are played out). Every aspect of Heilkunst therapy is ultimately aimed at achieving this higher form of health and consciousness. In our left-brained culture, these types of experiences can provide incredible revelations for the individual having them, and also be a great pointer to the existence of something “outside the box”. I have included the original video, and accompanying transcript below. I grew up to study the brain because I have a brother who has been diagnosed with a brain disorder, schizophrenia. And as a sister and as a scientist, I wanted to understand, why is it that I can take my dreams, I can connect them to my reality, and I can make my dreams come true — what is it about my brother’s brain and his schizophrenia that he cannot connect his dreams to a common, shared reality, so they instead become delusions? So I dedicated my career to research into the severe mental illnesses. And I moved from my home state of Indiana to Boston where I was working in the lab of Dr. Francine Benes, in the Harvard Department of Psychiatry. And in the lab, we were asking the question, What are the biological differences between the brains of individuals who would be diagnosed as normal control, as compared to the brains of individuals diagnosed with schizophrenia, schizoaffective, or bipolar disorder? So we were essentially mapping the microcircuitry of the brain, which cells are communicating with which cells, with which chemicals, and then with what quantities of those chemicals. So there was a lot of meaning in my life because I was performing this kind of research during the day. But then in the evenings and on the weekends I traveled as an advocate for NAMI, the National Alliance on Mental Illness. But on the morning of December 10 1996 I woke up to discover that I had a brain disorder of my own. A blood vessel exploded in the left half of my brain. And in the course of four hours I watched my brain completely deteriorate in its ability to process all information. On the morning of the hemorrhage I could not walk, talk, read, write or recall any of my life. I essentially became an infant in a woman’s body. Our right hemisphere is all about this present moment. It’s all about right here right now. Our right hemisphere, it thinks in pictures and it learns kinesthetically through the movement of our bodies. Information in the form of energy streams in simultaneously through all of our sensory systems. And then it explodes into this enormous collage of what this present moment looks like. What this present moment smells like and tastes like, what it feels like and what it sounds like. I am an energy being connected to the energy all around me through the consciousness of my right hemisphere. We are energy beings connected to one another through the consciousness of our right hemispheres as one human family. And right here, right now, all we are brothers and sisters on this planet, here to make the world a better place. And in this moment we are perfect. We are whole. And we are beautiful. My left hemisphere is a very different place. Our left hemisphere thinks linearly and methodically. Our left hemisphere is all about the past, and it’s all about the future. Our left hemisphere is designed to take that enormous collage of the present moment. And start picking details and more details and more details about those details. It then categorizes and organizes all that information. Associates it with everything in the past we’ve ever learned and projects into the future all of our possibilities. And our left hemisphere thinks in language. It’s that ongoing brain chatter that connects me and my internal world to my external world. It’s that little voice that says to me, “Hey, you gotta remember to pick up bananas on your way home, and eat ’em in the morning.” It’s that calculating intelligence that reminds me when I have to do my laundry. But perhaps most important, it’s that little voice that says to me, “I am. I am.” And as soon as my left hemisphere says to me “I am,” I become separate. I become a single solid individual separate from the energy flow around me and separate from you. And this was the portion of my brain that I lost on the morning of my stroke. On the morning of the stroke, I woke up to a pounding pain behind my left eye. And it was the kind of pain, caustic pain, that you get when you bite into ice cream. And it just gripped me and then it released me. Then it just gripped me and then released me. And it was very unusual for me to experience any kind of pain, so I thought OK, I’ll just start my normal routine. So I got up and I jumped onto my cardio glider, which is a full-body exercise machine. And I’m jamming away on this thing, and I’m realizing that my hands looked like primitive claws grasping onto the bar. I thought “that’s very peculiar” and I looked down at my body and I thought, “whoa, I’m a weird-looking thing.” And it was as though my consciousness had shifted away from my normal perception of reality, where I’m the person on the machine having the experience, to some esoteric space where I’m witnessing myself having this experience. And I lost my balance and I’m propped up against the wall. And I look down at my arm and I realize that I can no longer define the boundaries of my body. I can’t define where I begin and where I end. Because the atoms and the molecules of my arm blended with the atoms and molecules of the wall. And all I could detect was this energy. Energy. And I’m asking myself, “What is wrong with me, what is going on?” And in that moment, my brain chatter, my left hemisphere brain chatter went totally silent. Just like someone took a remote control and pushed the mute button and — total silence. And at first I was shocked to find myself inside of a silent mind. But then I was immediately captivated by the magnificence of energy around me. And because I could no longer identify the boundaries of my body, I felt enormous and expansive. I felt at one with all the energy that was, and it was beautiful there. So I gotta call help, I gotta call work. I couldn’t remember the number at work, so I remembered, in my office I had a business card with my number on it. So I go in my business room, I pull out a 3-inch stack of business cards. And I’m looking at the card on top, and even though I could see clearly in my mind’s eye what my business card looked like, I couldn’t tell if this was my card or not, because all I could see were pixels. And the pixels of the words blended with the pixels of the background and the pixels of the symbols, and I just couldn’t tell. And I would wait for what I call a wave of clarity. And in that moment, I would be able to reattach to normal reality and I could tell, that’s not the card, that’s not the card, that’s not the card. It took me 45 minutes to get one inch down inside of that stack of cards. In the meantime, for 45 minutes the hemorrhage is getting bigger in my left hemisphere. I do not understand numbers, I do not understand the telephone, but it’s the only plan I have. So I take the phone pad and I put it right here, I’d take the business card, I’d put it right here, and I’m matching the shape of the squiggles on the card to the shape of the squiggles on the phone pad. But then I would drift back out into La La Land, and not remember when I come back if I’d already dialed those numbers. So I had to wield my paralyzed arm like a stump, and cover the numbers as I went along and pushed them, so that as I would come back to normal reality I’d be able to tell, yes, I’ve already dialed that number. Eventually the whole number gets dialed, and I’m listening to the phone, and my colleague picks up the phone and he says to me, “Whoo woo wooo woo woo.” [laughter] And I think to myself, “Oh my gosh, he sounds like a golden retriever!” And so I say to him, clear in my mind I say to him. “This is Jill! I need help!” And what comes out of my voice is, “Whoo woo wooo woo woo.” I’m thinking, “Oh my gosh, I sound like a golden retriever.” So I couldn’t know, I didn’t know that I couldn’t speak or understand language until I tried. So he recognizes that I need help, and he gets me help. And a little while later, I am riding in an ambulance from one hospital across Boston to Mass General Hospital. And I curl up into a little fetal ball. And just like a balloon with the last bit of air just, just right out of the balloon I felt my energy lift and I felt my spirit surrender. And in that moment I knew that I was no longer the choreographer of my life. And either the doctors rescue my body and give me a second chance at life or this was perhaps my moment of transition. When I awoke later that afternoon I was shocked to discover that I was still alive. When I felt my spirit surrender, I said goodbye to my life, and my mind is now suspended between two very opposite planes of reality. Stimulation coming in through my sensory systems felt like pure pain. Light burned my brain like wildfire and sounds were so loud and chaotic that I could not pick a voice out from the background noise and I just wanted to escape. Because I could not identify the position of my body in space, I felt enormous and expensive, like a genie just liberated from her bottle. And my spirit soared free like a great whale gliding through the sea of silent euphoria. Harmonic. I remember thinking there’s no way I would ever be able to squeeze the enormousness of myself back inside this tiny little body. But I realized “But I’m still alive! I’m still alive and I have found Nirvana. And if I have found Nirvana and I’m still alive, then everyone who is alive can find Nirvana.” I picture a world filled with beautiful, peaceful, compassionate, loving people who knew that they could come to this space at any time. And that they could purposely choose to step to the right of their left hemispheres and find this peace. And then I realized what a tremendous gift this experience could be, what a stroke of insight this could be to how we live our lives. And it motivated my to recover. Two and a half weeks after the hemorrhage, the surgeons went in and they removed a blood clot the size of a golf ball that was pushing on my language centers. Here I am with my mama, who’s a true angel in my life. It took me eight years to completely recover. So who are we? We are the life force power of the universe, with manual dexterity and two cognitive minds. And we have the power to choose, moment by moment, who and how we want to be in the world. Right here right now, I can step into the consciousness of my right hemisphere where we are — I am — the life force power of the universe, and the life force power of the 50 trillion beautiful molecular geniuses that make up my form. At one with all that is. Or I can choose to step into the consciousness of my left hemisphere. where I become a single individual, a solid, separate from the flow, separate from you. 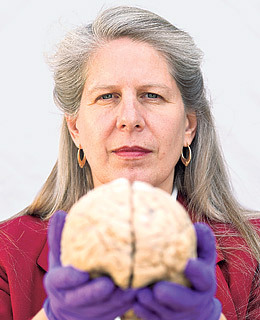 I am Dr. Jill Bolte Taylor, intellectual, neuroanatomist. These are the “we” inside of me. Which would you choose? Which do you choose? And when? I believe that the more time we spend choosing to run the deep inner peace circuitry of our right hemispheres, the more peace we will project into the world and the more peaceful our planet will be. And I thought that was an idea worth spreading. « “Into The Wild”, a new Heilkunst Movie coming to a theatre near you!